The São Paulo Brazil Temple is the 17th operating temple of The Church of Jesus Christ of Latter-day Saints. In 1975 at an area conference in Brazil, then President of the Mormon Church, Spencer W. Kimball, announced that a temple would be built in São Paulo. At that time, part of the cost of building a temple was borne by the general membership of the Mormon Church, South American members were given assignments to earn money towards the São Paulo Temple fund, in addition to paying tithes and offerings. Each ward or branch was assigned an amount of money to raise. Many of the members did not have money to contribute to the temple fund and instead offered rings, bracelets and other objects of gold, silver, and precious stones. Each ward that was assigned to raise an amount of money either met or surpassed the goal. Twelve months after the announcement of the temple, construction began. Hundreds of members gathered to clear the site, which included removing brush, weeds, and banana trees. Sacrifice continued with eight hundred members donating their time to produce fifty thousand blocks of cast stone composed of quartz, marble chips, and white concrete for the exterior of the São Paulo Temple. The São Paulo Temple was the first Mormon temple built in South America. It was dedicated on October 30, 1978 by President Spencer W. Kimball. At the time, there were more than 242,000 members of the Church living in South America, with 54,000 in Brazil alone. 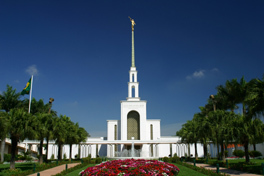 As of 2006 there are a total of thirteen Mormon temples in South America. In 2003, twenty-five years after the opening of the temple, a gold-leafed statue of the angel Moroni was added during an extensive renovation project, after which President Gordon B. Hinckley rededicated the Temple. The São Paulo Brazil Temple has a total of 59,246 square feet, two ordinance rooms, and four sealing rooms. This page was last edited on 7 December 2010, at 20:07.